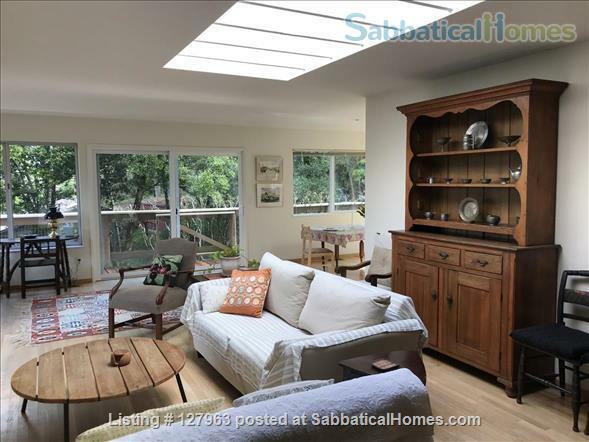 Recently restored 1920’s bungalow provides a Mediterranean retreat within easy access of Berkeley’s prime destinations. The house features a clean, relaxed décor with period narrow-plank oak floors, and a fully-equipped, spacious kitchen with warm cypress countertops, gas range, high-quality cookware, and European pottery. There is secure wifi internet throughout the house and garden. There is a front deck with small private garden, a rear deck and large garden, both connected to house by French patio doors. The house is on a quiet street, 0.6 mi (1 km) from the UC campus and from the Ashby BART (metro) Station and about 0.7 mi from the Berkeley BART station, and 0.3 mi (500m) to the renown Berkeley Bowl marketplace with an amazing selection of fresh produce, fish, meats, etc. Minimum rental 1 month, longer stays preferred. Available on request at no charge: baby crib. Optional: an additional bedroom available in a one-room garden cottage, well-suited for guests (for a small additional fee). Minimum 1 month stay, longer stays preferred. Monthly rate is based on 30day month, prorated as needed. I teach environmental science and planning at UC Berkeley, with a focus on environmental river management and restoration. I have conducted research on rivers and streams in North America, Latin America, Europe, Africa, and Asia. I live close to campus in Berkeley with my wife and two sons. My wife conducts research and teaches in flood risk management policy and green infrastructure. We normally spend part of the summer in Europe staying with family, so our house is normally available for rent during the summer, for 30-day minimum stays. Our family house in Inverness (Pt Reyes) is available for long-term (>4 mo) rental.